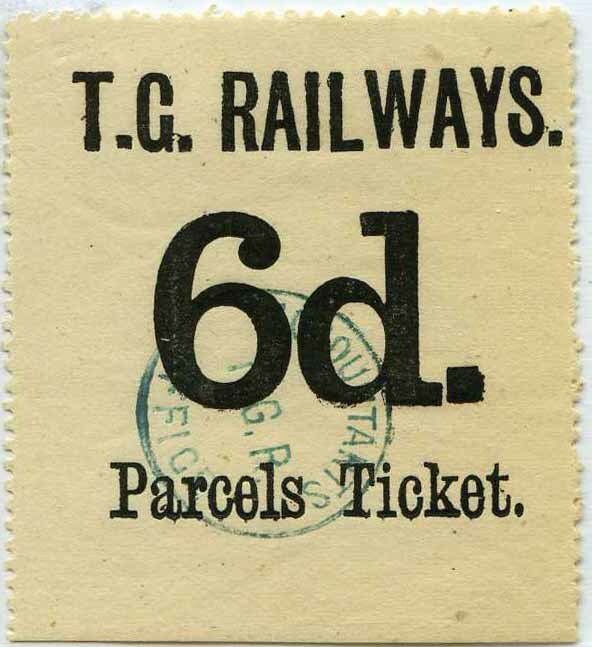 It has long been claimed by early students that the Tasmanian Government Railways introduced parcel stamps in 1902 as a result of the ban by the Federal Government on the delivery of mail to Tattersall’s lotteries. 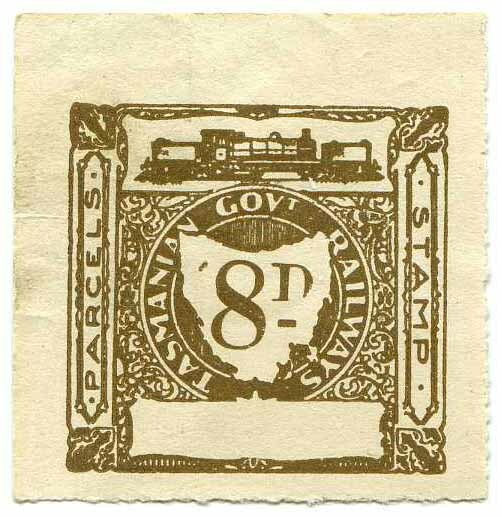 At this time the use of stamps for parcels traffic was well established, and while carrying Tattersall’s mail by rail as parcels Circumvented the prohibition, the stamps were not introduced expressly for this purpose. "A supply of the above which are of two values viz. 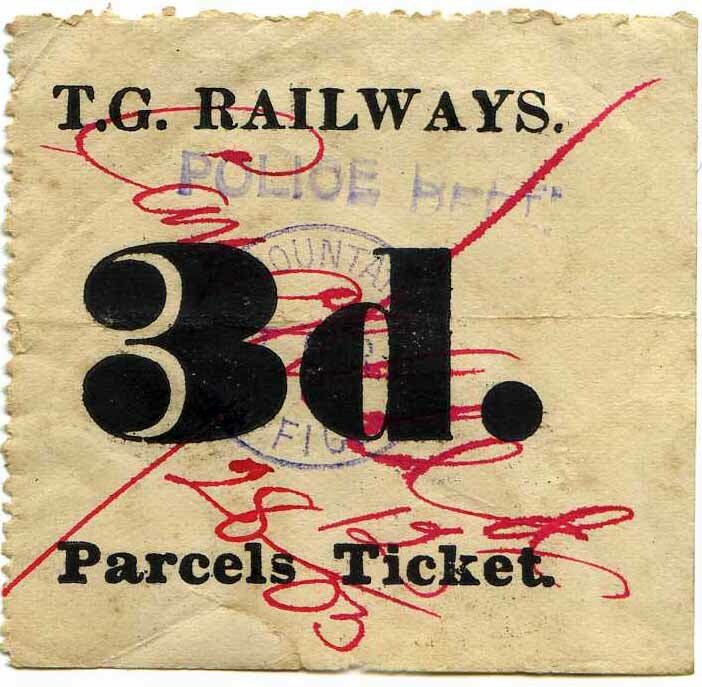 3d and 6d in sheets containing 12 can be obtained upon application to the undersigned. 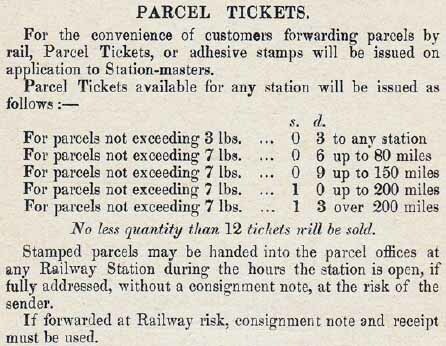 Parcel tickets are not to be accepted unless they bear the stamp of this office. 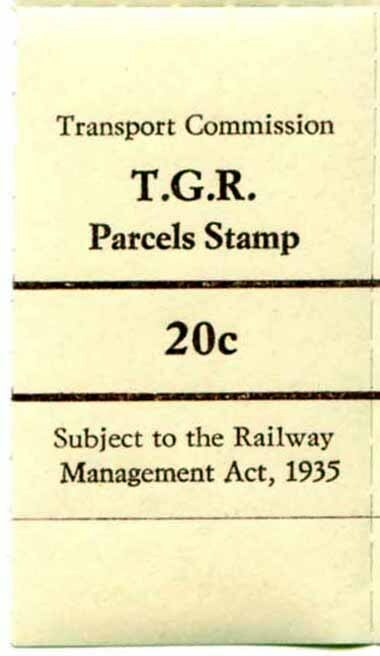 Stamps are to be obliterated by dating immediately on receipt of parcels by the Booking Clerk. 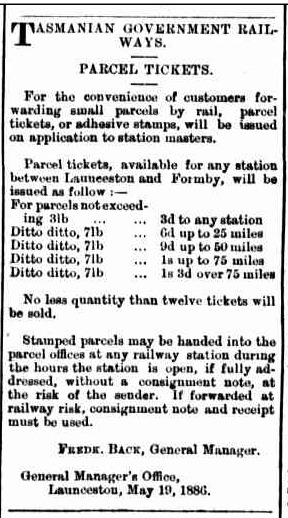 W H Lovett, Accountant"
Initially these stamps were only available for stations between Launceston and Formby (later renamed Devonport). 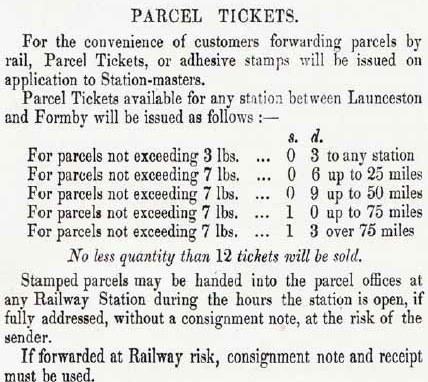 This limited availability was still shown in the 1890 rates book, even though they had been available on the Launceston-Scottsdale line in 1889. 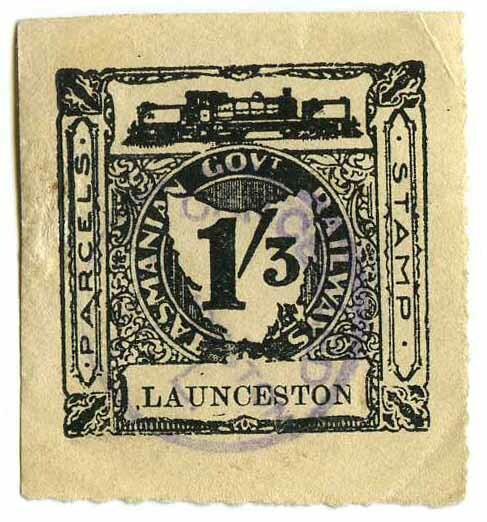 The Rates Manual issued in 1891, following the Government takeover of the Main Line between Hobart and Launceston in October 1890, extended their use to all stations. 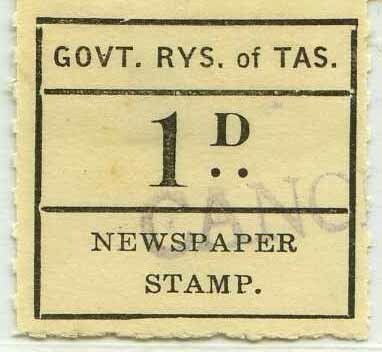 Specifically for use by the Tasmanian Dairy Association for the payment on the return of empty milk and cream cans. 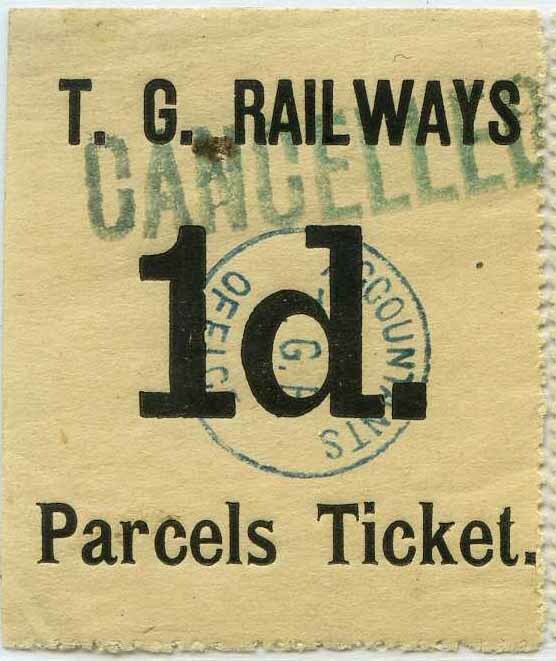 The 1d value had a very short life as in 1895 it was augmented in Parliament ".......and as an example of the anomalies empty beer barrels were carried on the railways for nothing, empty milk cans were charged 1d." 1d imperf pair vertically & at left-$200.00. 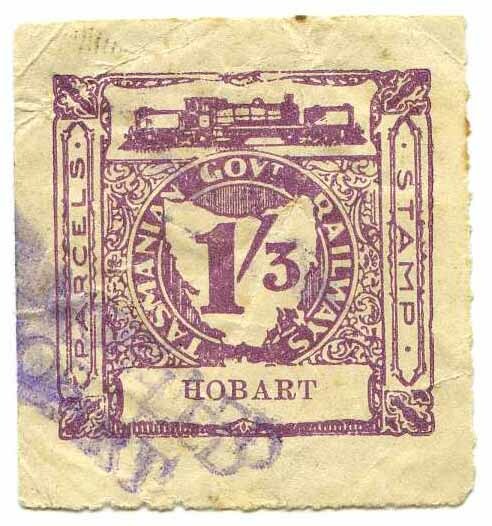 From the beginning of November 1891 Tasmanian newspapers sent by rail were carried free but from 1 November 1902 freight on newspapers was prepaid by the use of Newspaper Stamps obtainable from stations Hobart, Launceston, Devonport, Burnie, Zeehan, Regatta Point and Strahan. 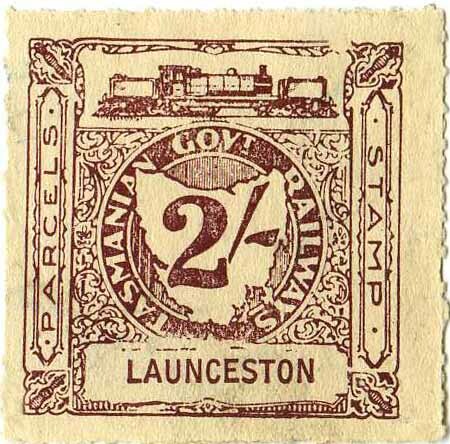 The locomotive used is an artistic representation of the L and M classes introduced on the main TGR system in 1912. 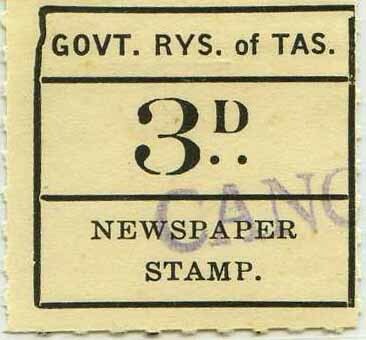 The following denominations were made available in the first issue: 3d, 4d, 6d, 9d, 1/-, 1/6, 2/-. 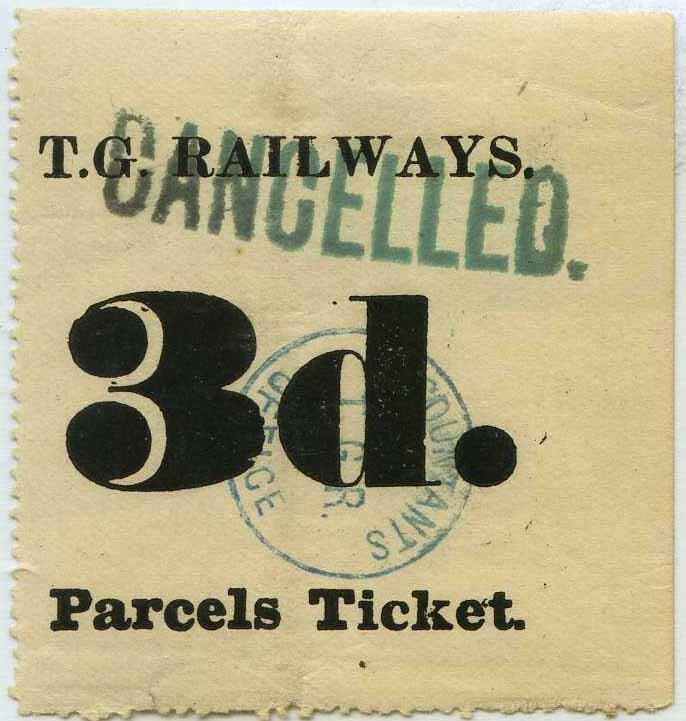 The 1/3d & 1/9d were added later. 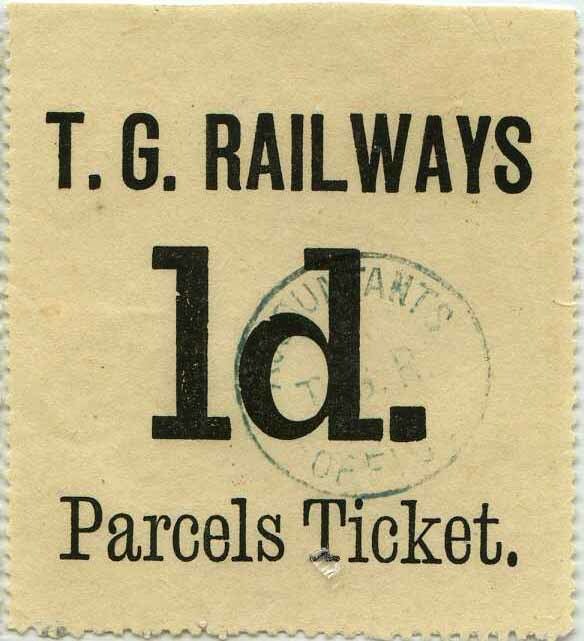 NOTE: The latest date for the use of the title Tasmanian Government Railways seen on stationery or other printed matter is November 1922 and the earliest use of the title Government Railways of Tasmania is February 1923. 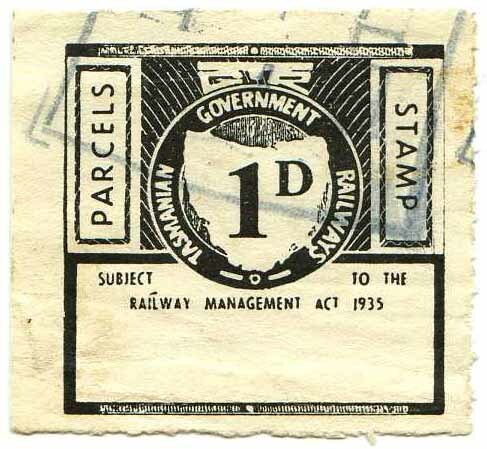 It is therefore unlikely these stamps appeared before 1923. 1d-$80.00 4d-$80.00 8d-$80.00 Mint remainders take off 50%. 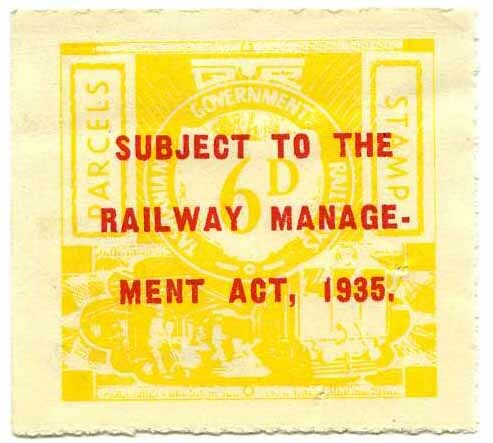 1955 No Watermark Roulette 6� Dark under UV light Printed in sheets of 12 3x4. First printing 1 December 1965. 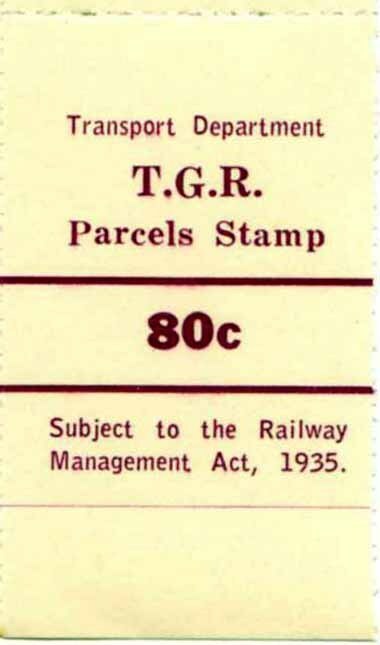 A number of intermediate values [15c, 25c, 35c, 45c] became necessary in 1967 also reprinting of existing values as a result of which two further printings were made and taken into stock 23 February 1967 and 4 July 1967. 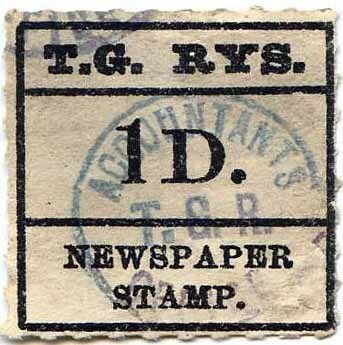 Both these subsequent printings overlooked the "1925-1935" correction and accordingly reappeared with the old error "1925". 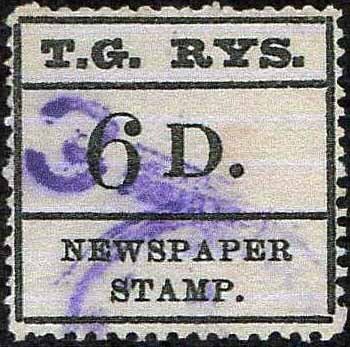 In the February printings the $1 & $2 values now appear with a double bar in the $ and the 5c & 10c values with very thin numerals than hereto. 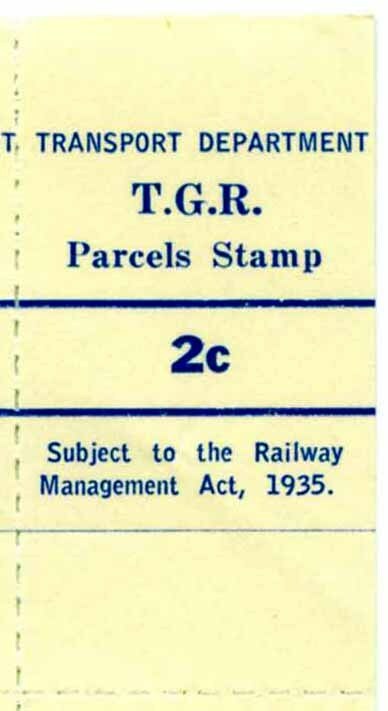 The February and July issues bore plate numbers [for the first time] these being 17193-B184 and 22813-B184 respectively. All values are on fluorescent paper. Three printings 6 February 1968, 5 October 1970 & 23 January 1973. Plate make up was 4 panes of 10 5x2 total 40 stamps. Plate numbers 4543-B103 & 8621-B103 respectively. 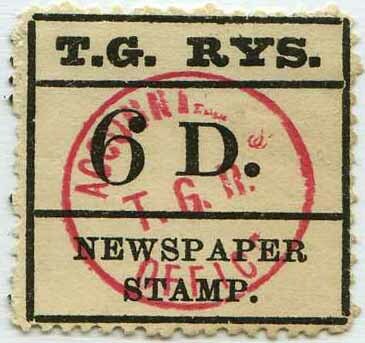 In the last printing the plate make up was 2 panes of 10 stamps [old plate cut in half]. The 4 pane make up can be identified by various means. Top Left Pane: R1 S1 & 5 the "M" of "Management" and the S of "Subject are damaged. 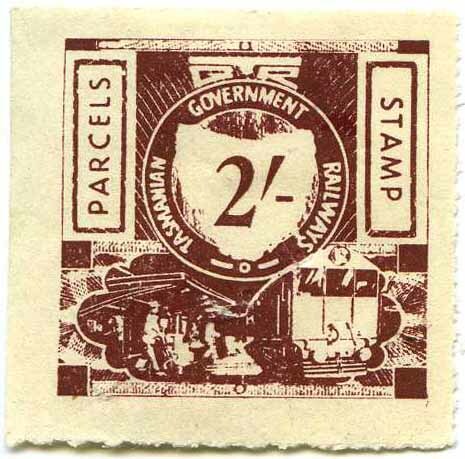 Top Right Pane: R2 S2 the "D" of "Department" is rounded at the lower angle. 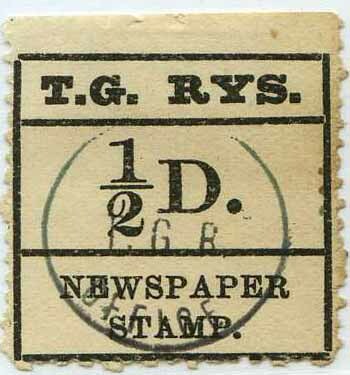 Lower Left Pane: R2 S3 & 5 the dot between "T.G." 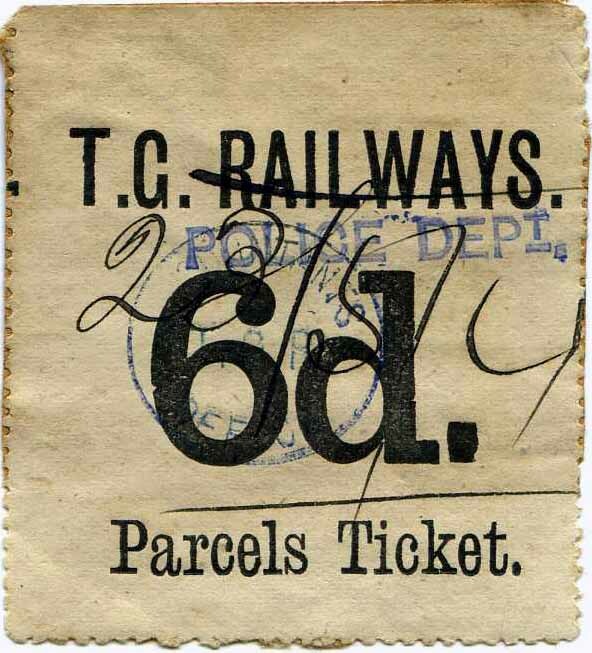 is over the "e" of "Parcels" and not the "l" of "Parcels". Lower Right Pane: R2 S3 there is a small dot between "th" of "the". All values are on non fluorescent paper. 1976[12 Jan] No Watermark white paper NEW Roulette now 4�. 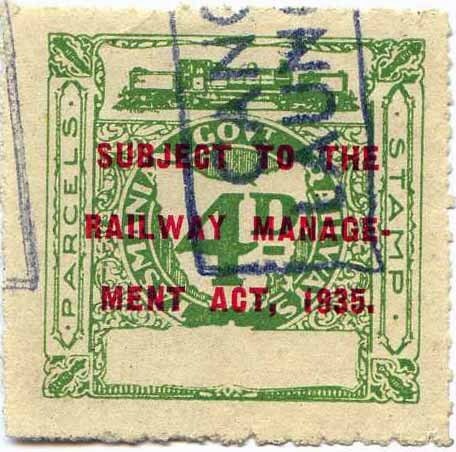 Height of stamp reduced by 4mm. Two printings 12 January 1976 & 2 June 1976. 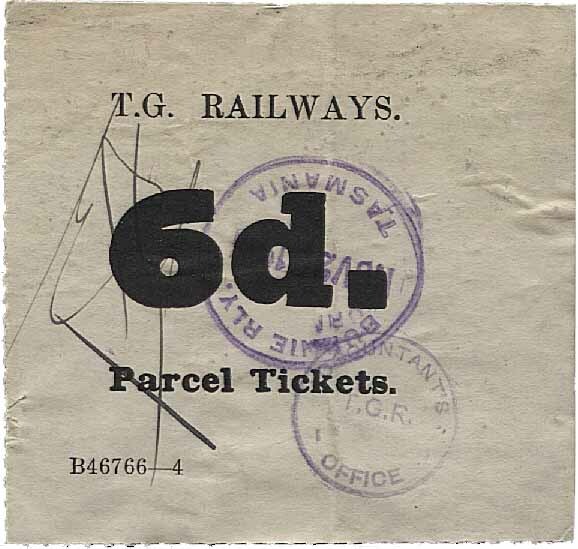 Plate numbers 4543-B103 [lower right15c-40c] & 8621-B103 [lower left 50c & $1 only] respectively. The two pane plate continued for this issue. 1976[12 Jan] No Watermark white paper NEW Roulette now 4¾. 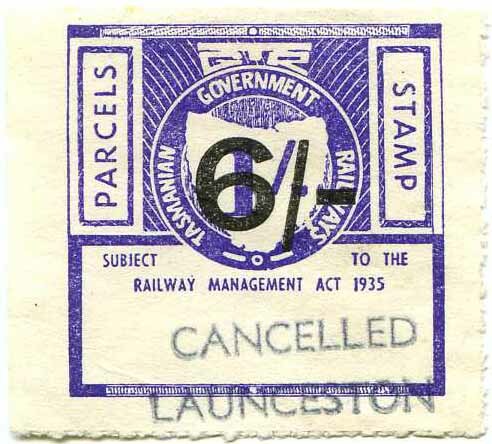 Height of stamp reduced by 4mm. 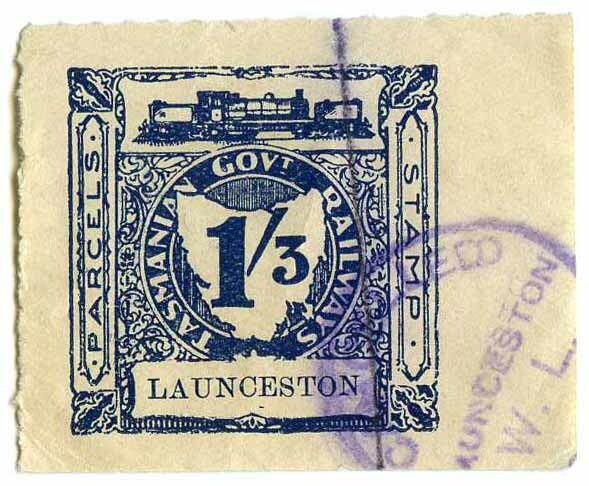 Meters were introduced 15 August 1968 at the 3 main stations [Meter numbers bracketed] Hobart [919D, 920D], Launceston [457D, 907D & 909D] & Devonport [913D]. 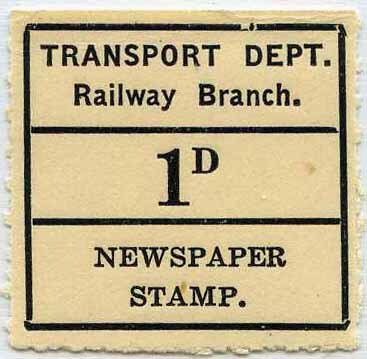 All were gummed labels on cream paper with saw tooth perf 14 on all sides. 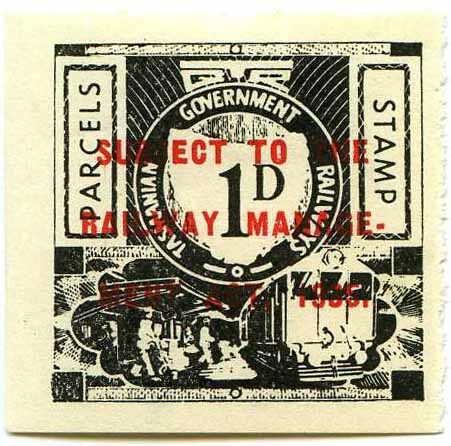 Produced by Pitney-Bowes franking machines. Height 32�mm with the length averaging 77mm which can vary. Except 1495a which always averages 135mm in length. 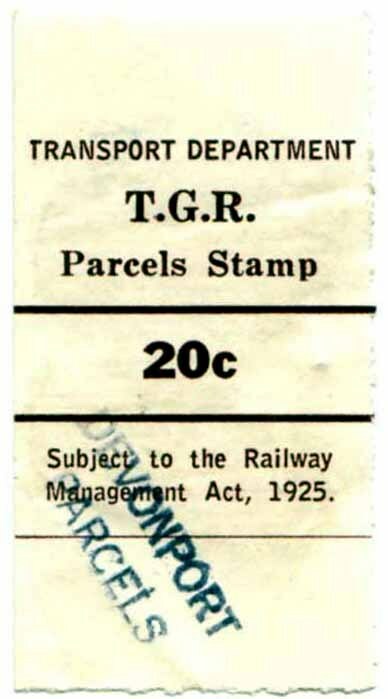 Parcel stamps and meters were withdrawn 1 July 1977.